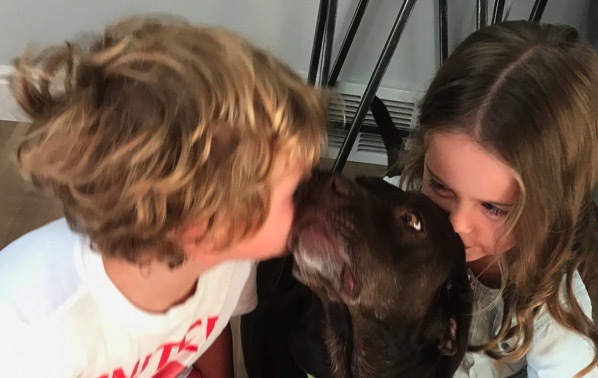 Officially my new favorite picture of these three. Seven and a half miles for my Wednesday morning! I don’t run on sidewalks anymore (those sidewalk cracks are out to get me) but I did for this picture. I just carefully watched the ground. After my run I did a little bit of strength and a little bit of race searching on my phone while I stretched. I’ve got some 5ks and 10ks that I have my eyes on and I might have also been looking into 2018 races to start getting a feel for what next year has to offer. 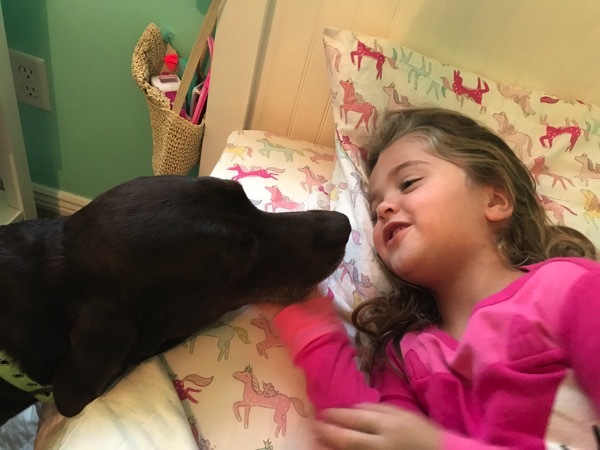 Came home and we woke up the kids. I got in a bunch of work and then met up with Megan for lunch. Remember when we used to be neighbors and connected at the hip? It was so fun to catch up with her on everything. I’ve missed her greatly. 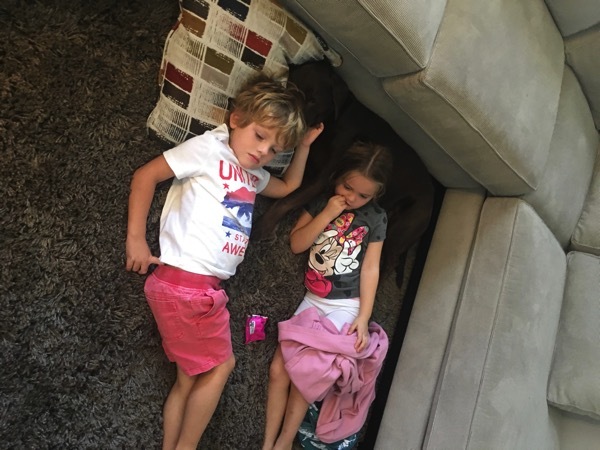 And watching a dog show with their favorite pillow. We went on over to Mer’s house to visit her.. we brought Kneaders pumpkin bread too. 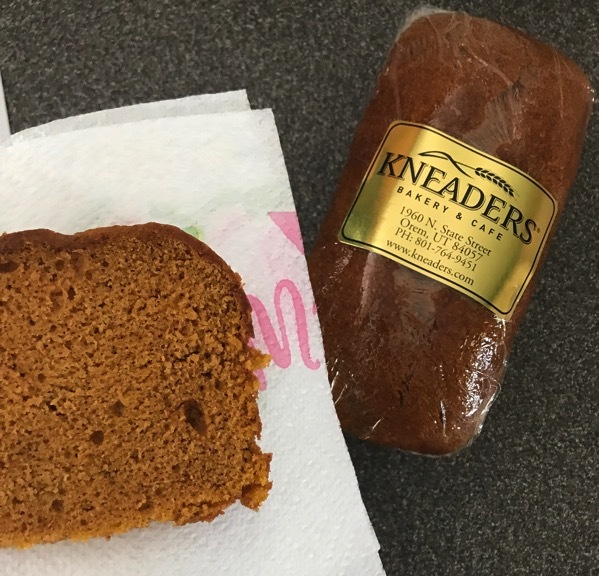 If you live by a Kneaders, please go get a loaf of this asap. Dinner wasn’t pretty but it tasted delicious. Peppers, onions, eggs and hot sauce. 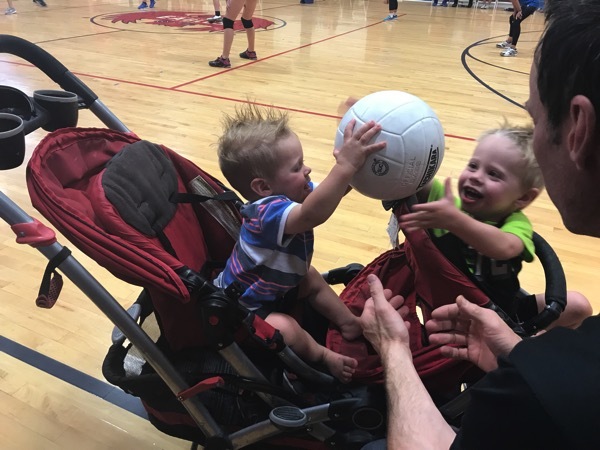 After dinner we went over to my niece’s volleyball game! I told you about this on Instagram yesterday but on Wednesday morning we were waken up by our smoke detector beeping. We were both wide awake at 4 a.m. and all I could think about were churros. I didn’t get a chance to get one yesterday but TODAY is the day that I will have one. I can’t stop thinking about them. Today, I’ve got a bunch of different interval/speed workouts for you to try! 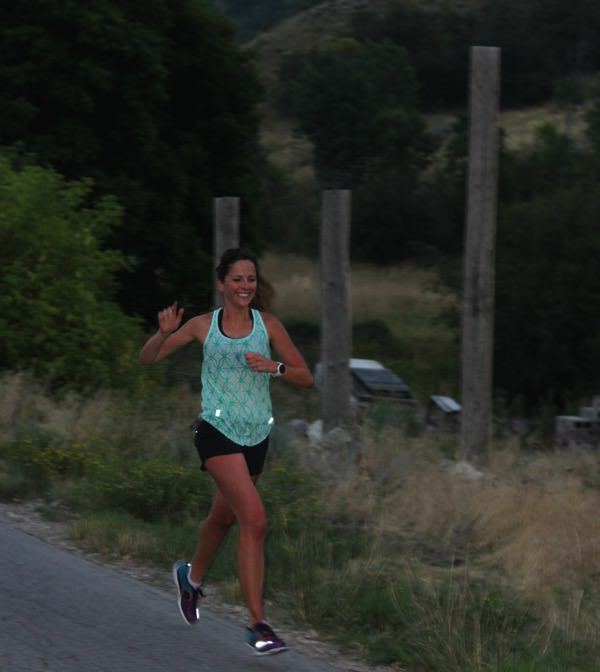 Intervals are a great way to help you to develop speed and they sure help me to avoid boredom with my running! They help you increase your endurance, mental/physical strength and intervals teach me to be more efficient with my running form. Remember to adjust these different workouts below to your current level of fitness! These are great workouts for you to start small and gradually get longer if you are a beginner! I don’t know where you are at but you can use these different workouts as a guide and adjust accordingly to where you are at and where you want to go! The beauty about intervals is that you can do it on the treadmill, the roads or the track! Remember if you are doing a lot of track work, switch the direction you are running every now and then… I’ve had IT Band problems in the past from doing too many track laps in the same direction:) Important… these are some guidelines to know if you are ready for intervals: ‘athletes running more than 20 miles per week, athletes who have completed strength phase of tempo, hills, and fartlek and experienced runners who have recently completed a base phase of 500 miles.’ (source). Avoid intervals when injured or feeling an injury coming! *For as many laps as you would like at the track, try going fast for the straight portions of the track with a jog/slower run/walk for the curves of the track! *10 x 400m with an equal amount of time for each recovery (so if your 400m take 100 seconds, take 100 seconds to recover) after each interval. 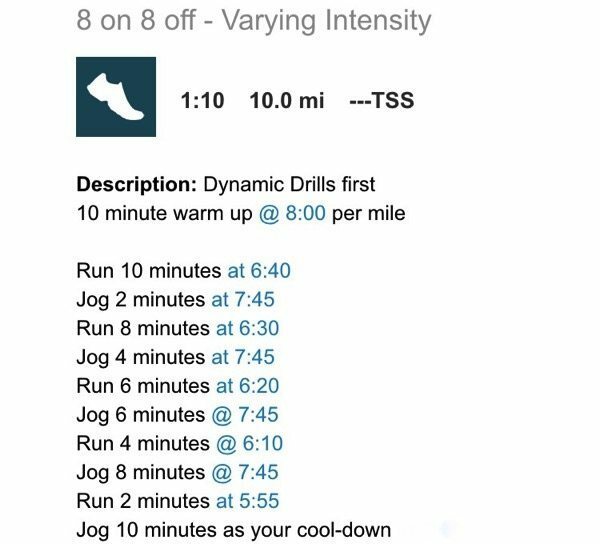 *A killer workout that I did for my last half marathon training (I built up to doing 12 800m’s and the pace is slower than a classic yasso workout). *Pyramid intervals (my favorite)! 1 minute fast, 1 minute recovery run/jog, 2 minutes fast, 2 minutes recovery run, 3 minutes fast, 3 minute recovery run, 4 minutes fast, 4 minute recovery run, 5 minutes fast, 5 minutes recovery run, 4 minutes fast, 4 minute recovery run, 3 minutes fast, 3 minute recovery run, 2 minutes fast, 2 minutes recovery run, 1 minute fast, 1 minute recovery run. 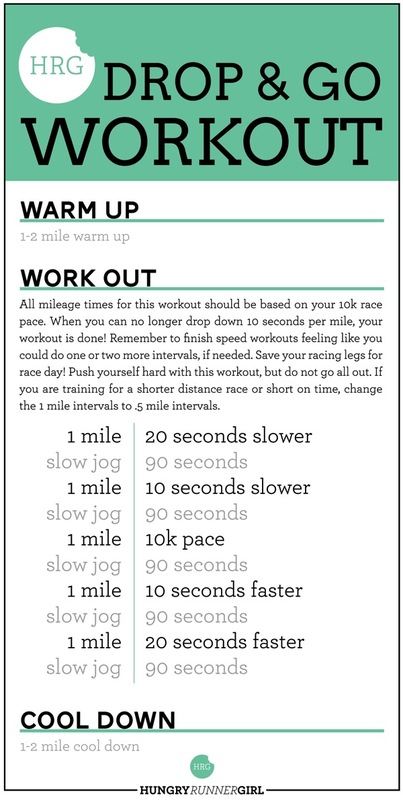 *One minute @ 5k pace followed by a 1 minute jog—> Do this 10-20 times! *I love intervals that start with the hardest one and decrease in distance and increase in speed from there: i.e. 1.5 miles fast, 1 mile faster, .5 mile even more fast, .25 mile fastest with 2-3 minute recoveries after each interval. *Training for a marathon? 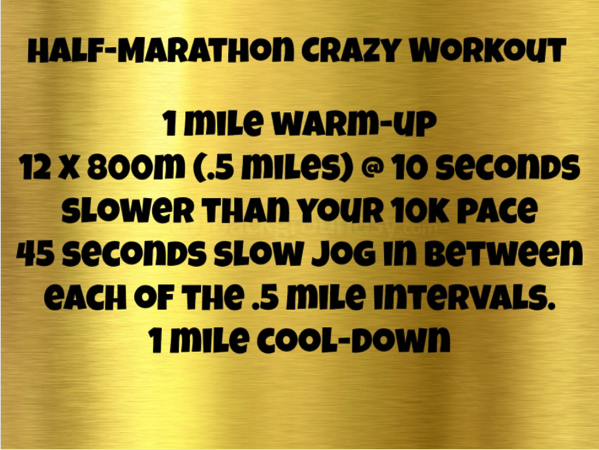 Try something like 4-6 miles @ 10-20 seconds faster than marathon pace with 2 minute recovery jogs after each mile. *An interval workout from my coach Dave that was so hard! Adjust your paces to where you are at! *400m @ 1 mile pace, 400m recovery jog, 800m @ 5k pace, 400m recovery jog—> repeat 3-6 times! *Of course I had to mention Yasso 800s! 10 x 800m (or .5 miles if on the treadmill/roads) with a recovery jog lasting as long as it took you to do the 800m interval. *On the treadmill I do intervals for time most often and love to do 10-15 x 2 minutes fast w/ 1-2 minute active recovery jogs after each interval. 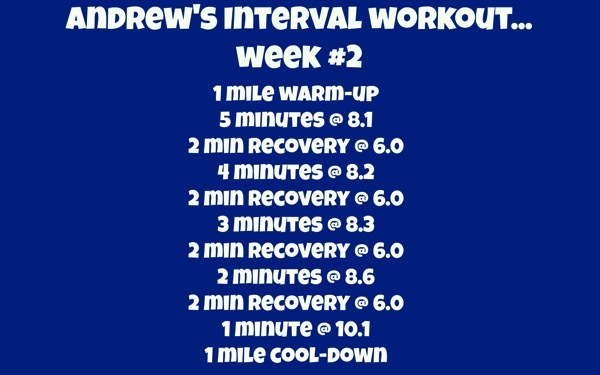 *A treadmill interval workout that Andrew really liked!! *2 x 1600m (1 mile), 2 x 800m, 2 x 400m, 2 x 200m. Recovery after 1600m intervals = 2-3 minutes, recovery after 800m intervals = 1.5 minutes, recovery after 400m intervals = 1 minute, recovery after 200m intervals= 30 seconds. *8 x 600m (about .373 miles) w/ jog recovery for 50-100% of interval time (so if the interval took you 3 minutes then your recovery should be between 1.5-3 minutes). (from Hansons Half-Marathon Method). *This drop and go (longer explanation of how to do it on this post) workout is a great one! *6 minutes easy run pace (1-2 minutes recovery jog), 5 minutes marathon pace (1-2 minutes recovery jog), 4 minutes threshold pace (1-2 minutes recovery jog), 3 minutes interval pace (1-2 minutes recovery jog), 2 minutes repetition pace (1-2 minutes recovery jog or rest). Repeat through these again if you want to! 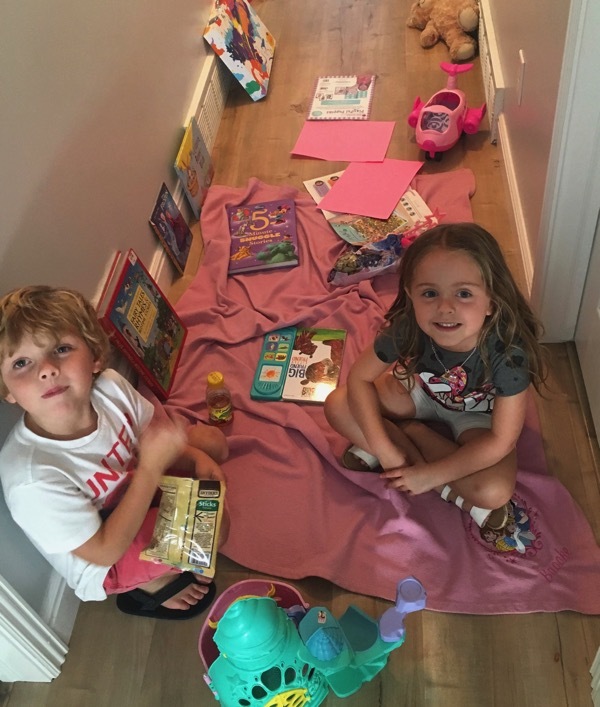 You can find what these paces are for YOU on this post! 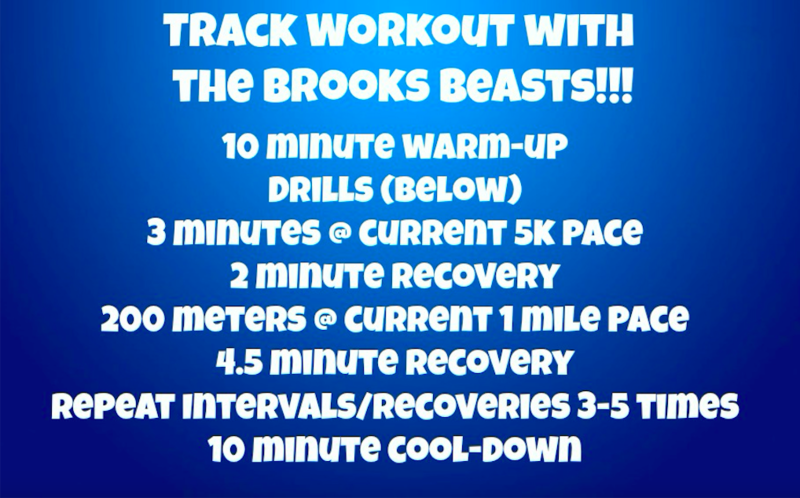 *A killer workout I did with the Brooks’ Beasts at altitude camp! *And if unstructured speed work or intervals are your thing—> this post has 10 ways to add unstructured speed to your workouts. Try them out! Don’t forget to check out my latest HRG Baby post! Have an awesome Thursday! Have any favorite interval workouts that you like to do? Please share!!! Who is signed up for any 2018 races yet? Which ones do you have your eye on? -I have my eye on a lot but don’t think I’ll sign up until I am able to see how my recovery goes after having this baby and how running is feeling again! Favorite pumpkin flavored item… cereal, bread, cookies, pumpkin butter, other? 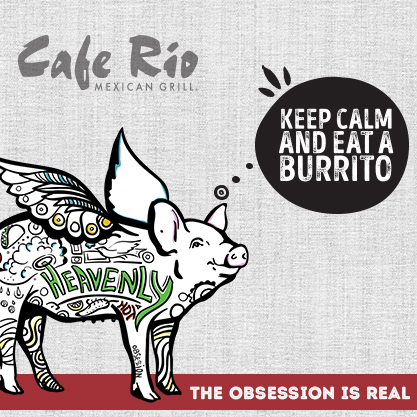 When using tortillas at home… what are your favorite things to add to the filling? -These sweet potato tacos that I used to make are my favorite (they aren’t fancy but they are delicious)! Like you, your kids are so photogenic. I love the one with your dog too, so cute. I haven’t planned anything in 2017. I’ll do mg regular races but not sure wht in between that. pumpkin bread all the way! I am signing up for a half next year that I always do (June) and then either a half or full in March………both of these races I have done every year, so I want to keep the streak alive! KEEP ME UPDATED LORIBETH on whether you are doing the half or full in March! I LOVE doing the same races each year too. Have a wonderful day! ME TOO… you would think we would fall more on the trails but nope… those dang sidewalks get us! Love the fresh, warm pumpkin donuts from the apple orchard. Dying to get out there soon so I can get some! I love all interval workouts — and they are a huge part of my past, since I “learned” how to run using intervals. No 2018 races yet, but I’m watching them! I love a good tortilla — I’ll use it as a tuna salad/chicken salad wrap OR cover them with a smear of tomato sauce and cheese with toppings and bake for a super crunchy thin crust pizza. That dinner looks delicious! I love putting cheese,m with veggies and chicken from a stir-fry in my tortillas–and adding some ketchup, too. I love pumpkin bread and pumpkin muffins! I don’t always love all of the pumpkin things, but those are winners for sure. I love that rainbow picture!! I love throwing some faster miles into the middle parts of my long runs, just to break it up! There’s a certain reservoir about 3 miles from where I live that’s a perfect 1-mile around, so I usually jog there, do 2-3 faster laps around it, then jog home when I’m training! I make these pumpkin chocolate chip cookies that are absolutely delicious; I usually make a huge batch and bring them into school for my students, and they go crazy for them! When I’m doing tortillas, I love ground turkey with adobo and taco seasoning, red peppers, cilantro, and tomatoes. I want to try your sweet potato one, though!! Adorable kids and these pictures of food made me hungry. I have been doing interval workouts in the past. Need to start them anytime soon. Thank you so much Jason! I hope you eat some delicious food today:) Good luck with starting some interval workouts soon!! I usually do ladder interval workouts on the track – 200, 400, 600, 800, etc. I don’t do them as often as I should! I’m thinking about the Charlottesville 10 miler in March 2018…I ran it earlier this year and did HORRIBLE so I’d like to redeem myself this year. Ladder intervals are the best… they keep your mind and body guessing! Oh I think that it is an awesome day to go for a redemption! Hands down the best pumpkin item is homemade pumpkin bread! I love the smell it makes when it cooks too. Such a staple fall item in my opinion. Like you, I’m also looking at races for 2018. I know I’ll do at least two 5ks (one for charity and one Thanksgiving morning) but I want to do a half marathon and/or a full marathon. I just have decide on which season I want to do them in. Spring means training in the cold and snow but fall means training in the hot summer…decisions need to be made lol. Thanksgiving races are the BEST! Keep me updated on what you decide Maureen and thank you!! 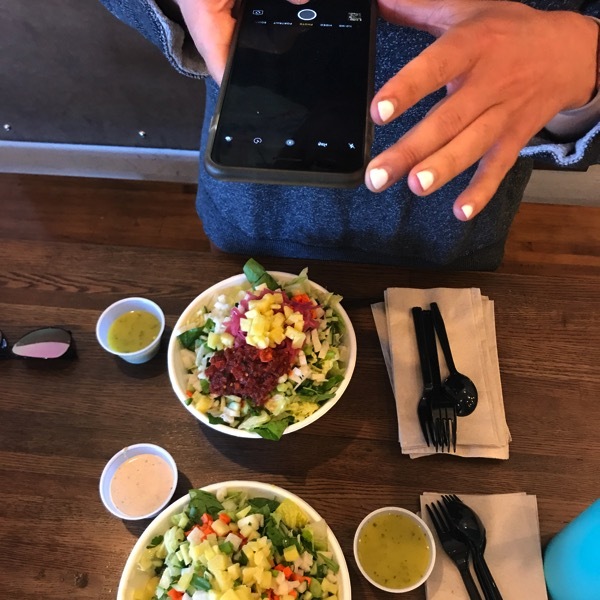 I love the blog so much and use you as inspiration daily to get out there and run–but I am so much slower than you and Andrew! His 6.0 recovery run is where I will “maybe” be on a good run for my faster intervals. Long and sloooow runs are my happy place tho! Thank you for showcasing the beauty of running and balancing that with work and kiddos! THANK YOU SARAH for your comment! Girl, you are rocking it and keep me updated with how you are doing! Love it when you post workouts. You are welcome!! Let me know if you try any of them! Have a fabulous day Mary Lynne!!! I’m registering for my first race for 2018 tomorrow, and it is Boston!!!! It took me 3 years and about 10 marathons to finally achieve a BQ!! I have about a 9.5 minute buffer under my qualifying time so I am feeling hopeful!! 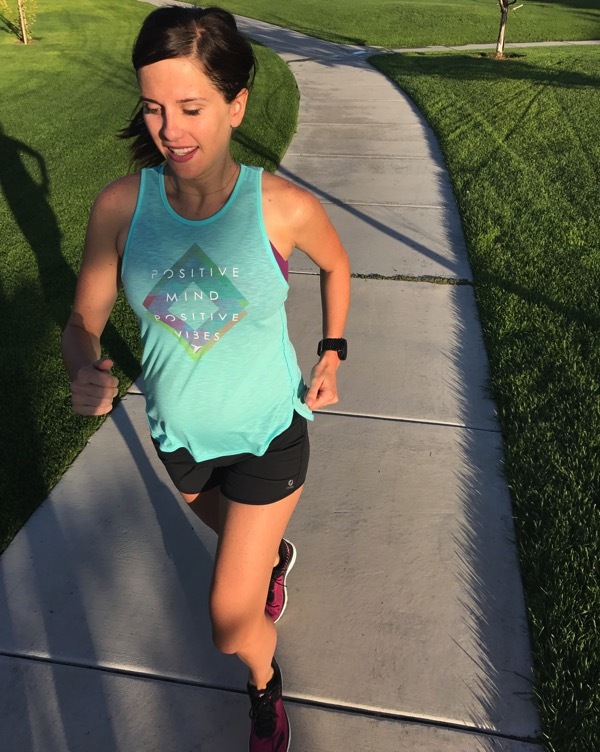 Love your blog, and you are rocking the pregnancy running!! Oh thank you so much Jen!!! I need to send you some of the Kneaders bread! I AM SO BEYOND EXCITED for you to run Boston and huge congrats on such an awesome time! Please keep me updated on your training and everything else. Have a fabulous Thursday! 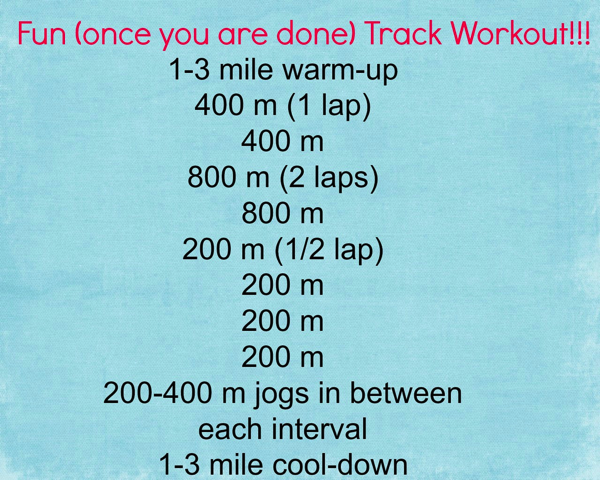 I’m going to do the drop and go workout tomorrow for my speed work I think. That sounds like a good one. I don’t love pumpkin flavored things. Probably bread or cookies are the best. Oh yay!! Let me know what you think of it Jenny! I hope you have a wonderful Thursday! I love how much time ALL of your families spend together!! 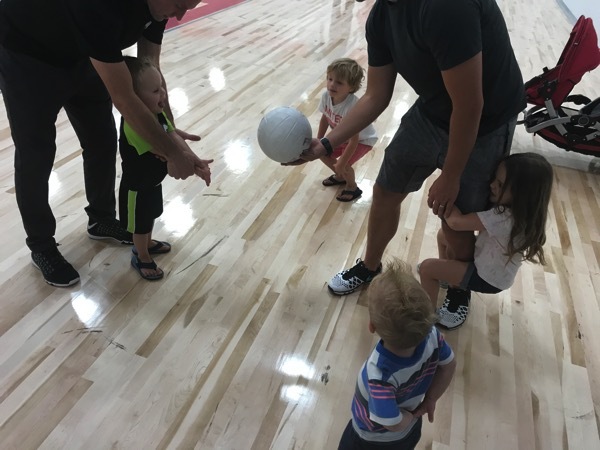 My husband and I want to make family time a priority for our future kids as well. 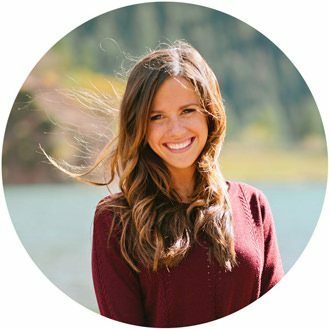 I am not a runner but I still love reading your blog :) You inspire me to stick to my workouts! Tonight, Zumba! That salad looks amazing and yessss to pumpkin bread! 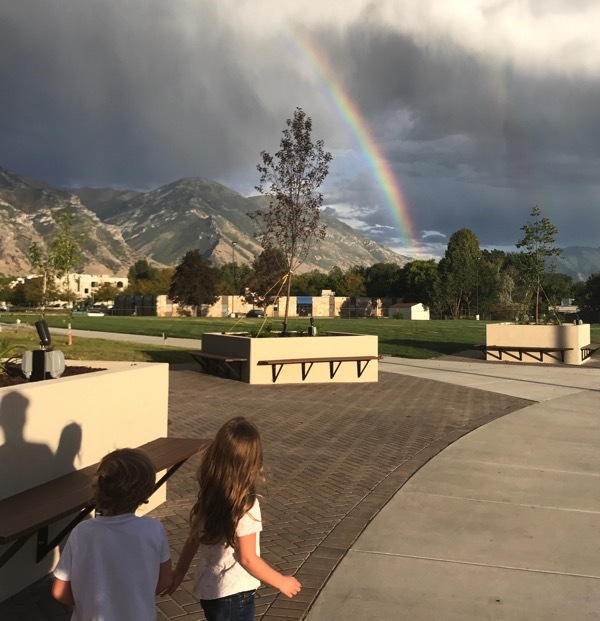 The pic of the kids is so cute and the rainbow picture is so awesome! Speaking of being clumsy…I’m the queen of that. This morning, I was transferring items from my grocery cart to the conveyor belt and lost the grip on the ice cream carton…it dropped, rolled, and I had to move my cart to get it. The funny thing is I am super shy and get so embarrassed. My husband is the best and if he is with me, we usually just laugh and then I’m not embarrassed. Unfortunately, I was alone for this one but we laughed about it later over the phone. Haha! He said the funniest thing is how embarrassed I get. Have a great day, Janae! 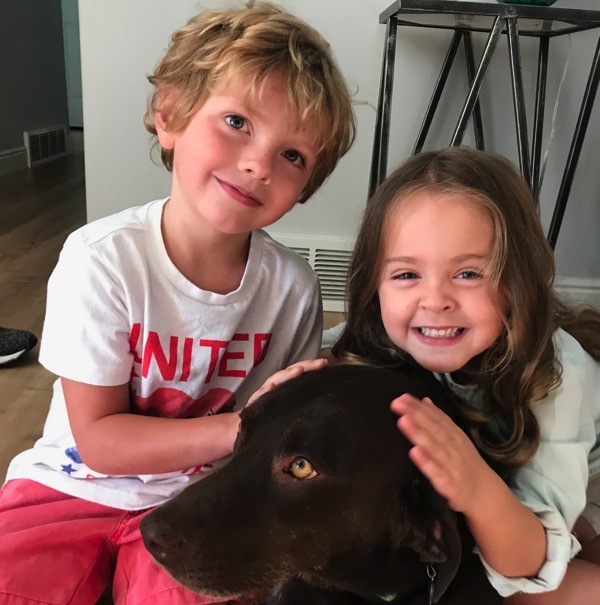 The picture of the kids and dog is so cute :). I plan on running the Cleveland marathon in May (it will be my first full!) and will run a half or two before that in 2018. Hopefully staying injury free! I am actually not a huge fan of pumpkin flavored things but I do like chocolate chip pumpkin muffins/bread. I have 2018 already planned out! 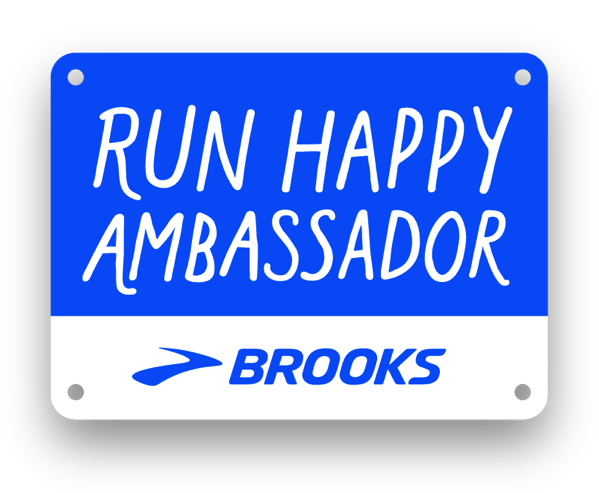 Because well….we runners are a special breed of crazy-awesome! ? The only event I have registered for is (what will be) my 2nd marathon!!!!! Other than that, I will have a 15k, couple of 10k’s, 10-miler, and probably a couple half-marathons. I’ll be running my 2nd marathon next year too! Yeah!! What marathon will you be running? My favorite speed workout isn’t intervals- 15 min @ half marathon pace, 2 x 10min @ 10k pace, 5min at AHHHH!!!! pace. 5 min recovery in between. 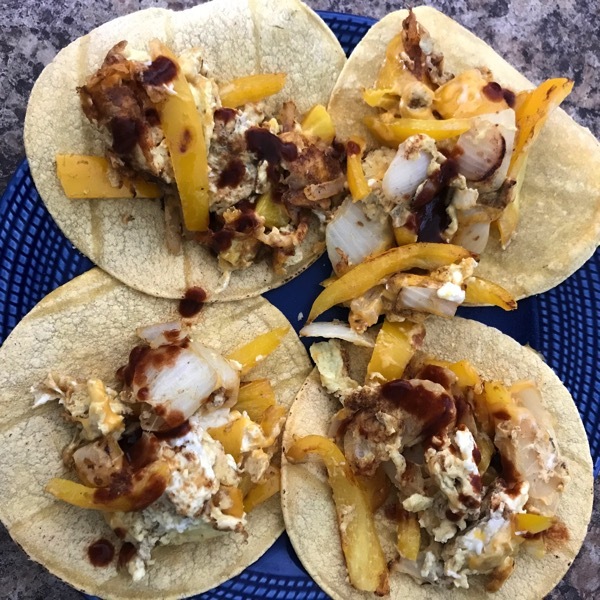 Tacos filled with left over chicken, sauteed peppers and onions, cotija cheese. 1 mi warm up, 6 min @ 30 sec slower than marathon pace, 2 min recovery, 5 min @ 30 seconds slower than MP, 2 min recovery, 4 min @ MP, 2 min recovery, 4 min @ 15 sec fast than MP, 2 min recovery, 3 min @ 1/2 MP, 2 min recovery, 1 min @ 10K pace, 2 min recovery. Boom. I like most things pumpkin, but I’m really digging pumpkin shredded wheat and pumpkin & chocolate chip bread. This makes me very excited for our Kneader’s, which will be the first one in KS and is opening right down the street from my house! I’m thinking of doing the SLO marathon next spring as I’ve done the half. So I’m enjoying the pumpkin spice latte with only 2 pumps from Starbucks. It comes with 4 and was way too sweet. Gosh I wish I had a kneaders! I need to make some homemade pumpkin bread soon! not signed up – but eyeing the ottawa marathon – taking all recommendations for first marathon…!